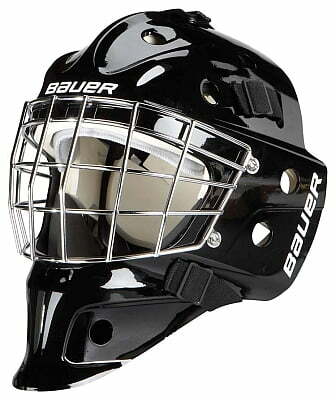 Bauer NME 3 Jr Goal Mask | Sports Etc. The NME series is an iconic style with an extremely lightweight construction. The tapered profile allows the face to sit comfortably near the front for greater peripheral vision. LEXAN* EXL polycarbonate shell design increases strength and durability of the helmet. Mask includes comfortable foam liner. Sports Etc Performance To Value Rating– 8 out of 10. Tapered mask with a comfortable foam liner. A lightweight, protective mask. Good for any youth goaltender.